St Andrews TTC’s fourth division team, Prospects, made up for their disappointment at finishing just outside the promotion places by grabbing the runners up medals in the Dundee and District Table Tennis Association’s last cup competition of 2013/14. This is Prospects’ first ever honour. 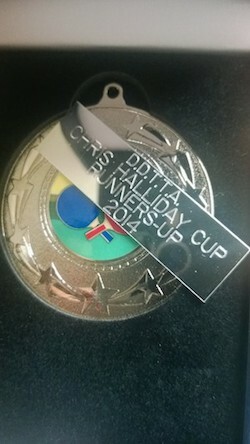 The Christine Halliday Cup is open to the lower division teams and played in an unusual but fun format. The three man teams play games comprising a single set to 61 points. The players can be swapped around at any time during the game with the only rule being that a player cannot stay on the table for more than ten consecutive points. Prospects gave their newest teammate, Robert Brown his competitive debut alongside regular (but unorthodox) Vuksan Mijovic and the team’s other relative newcomer, penholder Federico di Pace. The competition was played on a round robin basis and, after using the first game to sort out their tactics, Prospects comfortably won their next two matches – which proved enough to take a medal. Well done guys. This entry was posted in Match reports, St Andrews Table Tennis Club on April 16, 2014 by standrewstt.